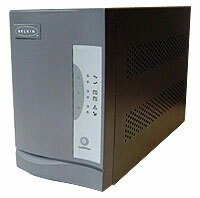 Abstract: Don't be fooled by the UPS moniker - this is a pretty advanced piece of kit for the SOHO or home system. Update: This Belkin UPS up and died after 2-3 years use. As many users have experienced, it just stopped turning on one day and the power receptacles along the battery backup circuit wouldn't supply power. Upon opening the unit up, cause was apparently dried out batteries (audible rattling sound). Insurance is mandatory when you go car shopping - after all protecting such a valuable part of our daily lives is a given. When it comes to computers, most people don't even consider the perils that can befall a computer simply plugged into the wall outlet. Universal Power Supplies seem pretty trivial next to flashy video cards or LCD displays, but when it comes to protecting you from lightning strikes or other power problems they are one of the most important pieces of equipment, and insurance. If you live in rural areas you are more accustomed to power outages and no doubt understand the usefulness of a UPS which will give you a few minutes to finish up your work, save it and properly close down the computer. Belkin make one such device which is rated at 800VA (more on this term in just a second, so hold your questions) and features four battery back up/surge protected plugs (two additional surge protected), surge protected phone or RJ-45 Ethernet lines and a direct connection to the host computer for a bevy of reactionary procedures in the event of a power failure. 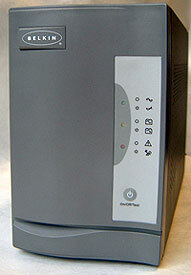 Don't be fooled by the UPS moniker - this is a pretty advanced piece of kit for the SOHO or home system. Since most of us only use a $20 surge protecting power bar to protect a $2000 computer you'd think that not too many people take "dirty power" that seriously. However 'brown outs' can cause problems with devices operating in tight power tolerances. This is not something which boasts a lot of trust to operations which requires computers to support 100% data security. The Belkin UPS (Uninterrupted Power Supply) takes power protection to another level by offering a lot of extra features of standard surge protectors. While a power bar will stop you from overloading a circuit if you plug in too many things, and surge protecting power bar will help prevent damage during electricity spikes (such as lightening), a UPS adds that extra touch - time. Depending on the amount of equipment you have plugged into the Belkin 800VA, it will allow you up to 45minutes to save your data and shut down the computer as it switches over to internal batteries. Without that stored energy, the power to your computer would be cut off immediately during a power outage. This is important since most people don't constantly save their work, and if your computer turns off suddenly this can be disastrous. The Belkin Universal UPS 800VA also filters out the spikes and dips (brown outs) in the electricity coming down the wire and out from the wall. For about $180 CDN ($120 US) the Belkin Universal UPS 800VA has space for four devices with full power redundancy, and two with just surge protection. Only the four top plugs will receive filtered power in the event of a blackout or brownout. 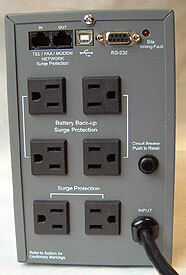 The remaining two plugs act simply as a surge suppressor. The UPS 800VA offers protection for RJ11/RJ45 phone/Ethernet jacks should a surge of power come down via the phone or network cables. Phone cables are the worst offenders in lightning strikes, but Ethernet cables are also susceptible if they are run along the outside of a building. Pg 3. What does 800VA mean to a UPS?